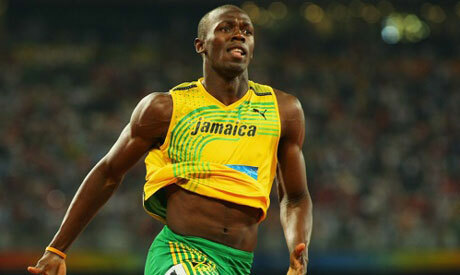 Athletics: Bolt to head cast at London's "anniversary games"
"I have pretty much four more years I think personally, in the sport, so now it is all about dominating for those four years," Bolt, 26, told a news conference in Rome where he was preparing to make his European season debut at Thursday's Golden Gala meeting. "I am looking forward to the next Olympics to do something that has never been done before so that is one of my biggest things right now," he said. Bolt, Olympic champion and world record holder over 100 and 200 meters, has struggled with a slight hamstring strain this year and last competed in a meeting in the Cayman Islands last month where he ran the 100 at a relatively pedestrian 10.09 seconds. As well as Bolt, Thursday's field includes American Justin Gatlin, bronze medalist at the London Olympics, and 2003 world champion Kim Collins from St Kitts and Nevis. The Jamaican was confident that he had overcome the injury problems which dogged the start of his year and said he would not relax his hold over a sport he has dominated since his triumph at the Beijing Olympics of 2008. "It is going to take hard work and I really look forward to the competition because it drives me and it helps the sport. I am going to do as much as possible and enjoy it and help to develop the sport over the years," he said.